Have you ever wanted wisdom from couples who have been there and made it through the wild and wonderful world of raising children? 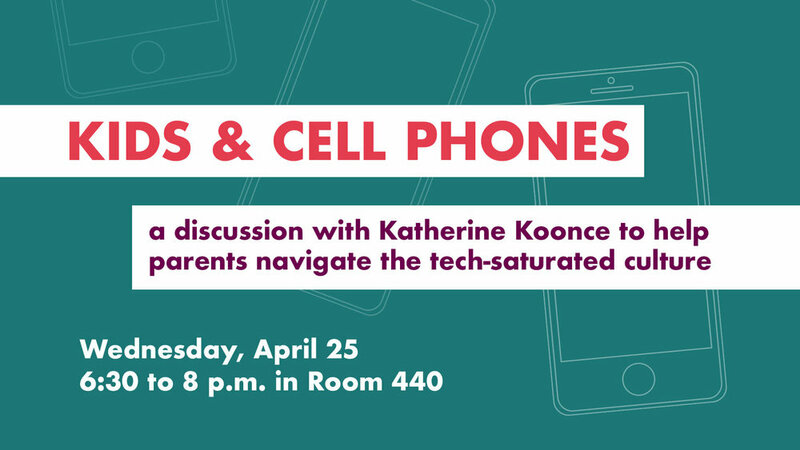 We're hosting panels with seasoned parents on Wednesdays (starting April 11 and going until May 2) from 10 to 11 a.m.
A discussion with Dr. Katherine Koonce on Wednesday, April 25 from 6:30 to 8 p.m.
Parents in the early stages of the "cell phone odyssey" - we hope you will join us for a special evening of discussion, designed with your children in mind. Sometime in the next few years, your child might be getting a cell phone, or perhaps your children already have phones. Either way, they need to be prepared well to handle such a huge responsibility. You, as their parents, must also do your homework so that you know how to set their devices up with appropriate restrictions, monitor their use of devices while still remaining approachable, and create with them a reasonable internet safety plan. We parents must work to maintain quality relationship with our children, even while not always agreeing on matters of the cell phone. Whether your child is years away from a cell phone or already has one, this evening will provide important discussion to help you steward well your children's hearts as they grow up in our tech-saturated culture. This discussion is ideal for the parents of elementary and middle school students.